Cordelia Naismith is enjoying a baptism of fire. Her first mission is to captain a throwaway warship of the Betan Expeditionary Force on a mission to destroy an entire enemy armada. Discovering deception within deception, treachery within treachery, she is forced into an uneasy peace with her nemesis: Lord Aral Vorkosigan. Discovering that astrocartography is not the soundest training for a military leader, Cordelia rapidly finds herself the prisoner of the Barrayaran Captain Aral Vorkosigan, also known as 'The Butcher of Komarr'. But the notorious captain is not quite the beast Cordelia was expecting and a grudging respect develops between the two of them. As captor and prisoner on an abandoned outpost planet, the honourable captain and the resolute scientist must rely on each others' trust to survive a trek across dangerous terrain, thus sparking a relationship that shares the struggles of culture and politics between their worlds. I finally began reading the Vorkosigan science fiction saga by Lois McMaster Bujold. Although I understand that Miles, their son, is the main character throughout the rest of the series, I decided to begin at the beginning by reading Cordelia Naismith and Aral Vorkosigan's story. I figured the backstory would help me understand Miles' character better later on. I think it was a good move. As the first full-length novel in the series Shards of Honour is key. It serves two purposes: one is to give the readers of this series Miles' family history from both sides, and the other is to introduce the complex political, military and cultural differences between the Barrayaran and the worlds they war against, the Betan included. Bujold uses the slow developing and low-key romance between Cordelia and Aral to build her world through exchanges of information and conversations between the two main characters. They first meet as enemies, but slowly the need to fight for survival in an alien planet brings them together and Cordelia and Aral form a bond of trust through honor and finally affection. Honor and valor are also key to this story. It is what drives Aral and what he finds in Cordelia -- that, plus strength and will. Cordelia is not only Aral's ideal of a warrior's wife, but everything he himself would like to be as a warrior. Yet, she is not a warrior but a scientist. Aral is a man of honor through and through, but he is also a military strategist and in his heart, a politician. As such, he must make tough decisions that bruise his sense of self. Cordelia understands him and soothes his soul. Barrayar's politics are quite complex in this story, and what begins as an attack on Cordelia's scientific party in an alien planet balloons into a disproportionate situation that places more than just a few people in danger. There are betrayals behind betrayals, secrets, and massive amounts of people die or are tortured, planets go to war and in the end Bujold leaves the reader with gray areas as to where responsibilities really lie for the loses and slaughter, and even Cordelia must make a tough choice between her own world and Aral's. 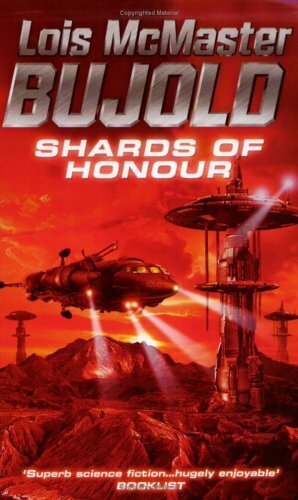 Shards of Honour is most definitely a science fiction novel though. Bujold incorporates the necessary details seamlessly into her worldbuilding. Beginning with the alien planet where Cordelia and Aral meet, and where they both use whatever futuristic science there is to survive, and ending with the space ships and developing edgy science used to win and lose wars. However, I walked away from Shards of Honour thinking mostly about characterization and complex plotting. The romance that Bujold developed between two mature adults that grows from admiration to an almost quiet, deep love was rather enjoyable, and the complex political circumstances and militaristic Barrayaran culture fascinating. So I'm on my way and can't wait to continue by reading the second book in the series, Barrayar. Visit Lois McMaster Bujold here. 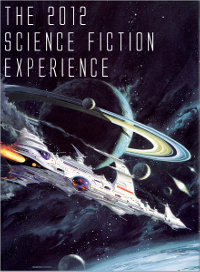 Read as part of The 2012 Science Fiction Experience. Angie, I agree. The SF/Romance were sooo well integrated. I loved the way Bujold began her world building THROUGH the characters' conversations as they were getting to know each other, and the romance began to develop. That part of it was just excellent and seamless. I'm really looking forward to reading Barrayar now to find out what happens next and to see how Bujold continues to build on this novel. I've been needing to read this author's work for some time now. I want to say I have the first in her Sharing Knife fantasy series somewhere, but I actually like the sound of this one more. I dunno, maybe the scifi romance angle is speaking to me. Think I'll hope over to my kindle and see how much it is. Thanks for your great review! This book sounds very interesting, I don't know why since I'm not a Sci Fi kind of girl but I'm intrigued - I do enjoy the whole politics and power plays thing from time to time - and I'm intrigued about the love woven into the story, :P even though it's not the main focus it sounds like it's well done. KMont -- the Sharing Knife books are very good too. Bujold's worldbuilding is always stellar, and I love how she managed to come up something fresh and different for her magic system in that series. The romance plot is actually stronger in SK, so much so that a lot of the genre SF/Fantasy fans complained about it. [wry smile] For those of us who like both, though, it's a great mix. Seconding Victoria's comment! I actually read Shards/Barrayar in the omnibus version, so think of them as one story - I admit I can't for the life of me remember where Shards finished and Barrayar started. Angie, thanks! And you know? It's interesting how different fans view this genre -- I find it to be a very rigid fanbase. I'm so fluid in what I like and read that I tend not to understand those lines drawn in the sand. Victoria, definitely! I can't wait to continue with the series. I have Barrayar sitting on my coffe table and am petting it... that means it will be devoured soon! KMont, the Baen Library had the whole series free a while back in ebook format. I don't know if that is still the case, but check it out! Hilcia -- I read somewhere (as hearsay, although it sounds like something that could be accurate) that after the criticism for SK, Bujold commented rather wryly that science fiction is about politics, and that that was the basis of the criticism. Since Sharing Knife, and particularly the first book, has the romance as a -- and possibly THE -- primary plotline, it violated that rule. I hadn't thought of it that way before, but thinking about SF, yeah, it works. At least for longer SF, there does seem to be a strong political point to the main plotline in most cases, and I actually can't think of any major examples where that isn't true. So some large chunk of the SF readers were bothered, and some were actually angry, that SK's main plotline was based on something as trivial [cough] as two people forming a romantic relationship, even though there certainly are political issues in the books. I'm with you in that I like both, although I'll admit my expectations do play into how well I enjoy something. Maybe because Bujold has written romance before, and the blurb for SK set me up to expect a romance plotline. I might not've gone in expecting it to be the primary plotline, but the fact that it was wasn't a major shock to me. [ponder] Someone who's not a romance reader, though, and expects SF (or fantasy) period might've felt blindsided and grumpy. I can't help but agree with that statement (be it true or a rumor). In many ways science fiction can be said to be political or at least it usually addresses subjects that are hot buttons at the time the stories are written. At least I've also found that to be the case. For example, in last year's Embassytown by Mieville, he based his story on the effects of colonization on the native populations. Yes, the natives were aliens and the colonization took place in a planet, but the effects were quite familiar if you look at history and the final results on that alien culture. Also in last year's Leviathan Wakes, Corey uses a war between the planets in our immediate galaxy to illustrate how ill prepared humans are to go forward due to our own limitations... Approximate quote: "If we can't even take care of our own galaxy because we are at war with each other, how the heck do we dare think we are prepared to go out there... " Of course there others who address the environment, and/or corporate corruption, gender bending, etc, etc... Or as in the old 60's and 70's the military sci fi that dealt with the Vietnam war. However, I STILL don't see how inserting a storyline about two people having a relationship in any of these circumstances can be viewed as a no-no! Humans have relationships, and the most important relationship is usually some sort of emotional, romantic involvement. Why look at it as a detriment to the storyline? Even if a reader expects SF, and gets SF, a romantic thread doesn't necessarily need to be viewed as detrimental. Hilcia -- it wasn't Shards of Honor that people objected too, though, but rather Sharing Knife. I got the impression while reading SK that it was mainly a romance with an adventure external plotline (which is a pattern many genre romances follow) rather than a fantasy adventure story with a romance subplot. I enjoyed it, but pure SF/Fantasy fans apparently felt the emphasis was skewed enough to complain of. However, my statement holds! I've heard enough complaints about SF with romance lines, lol! I finally read Shards of Honor a few weeks ago. I've been wanting to get to this series for some time but, as usually happens, books pile up. Not a bad problem. I enjoyed this one greatly. I like romance in my fiction and I thought Bujold did an admirable job of weaving in a romance that felt authentic while at the same time creating an interesting SF universe. The characters were the focus for me and I enjoyed the time spent with both Cordelia and Vor. I'll want to read the rest of the series and have heard nothing but good things about the Miles books, but even now I feel sad about having only one more Cordelia/Vor focused book to read. I loved the way Bujold weaved an essentially militaristic and politically driven SF world with romance in this novel. In my way of thinking it was quite subtle -- and both were intrinsic to the novel's success. But like you, I walked away from this novel thinking mostly about the characters. I'm already familiar with Miles through a couple of short stories I read out of sequence and am looking forward to reading his adventures. But like you, I'm a bit sad that I only have one more book to read with Cordelia and Aral as central characters. I don't read many stories with the lead being a female protagonist. It isn't by conscious choice, it just seems to be that way. So the idea of another book series with a strong female character excites me and that is really the big part of why I'm sad to only have one more Cordelia focused book. I need to get back to Tanya Huff's Valor series. I generally read at least one of these this time of year and I have two left before I am caught up. Carl, I understand. Most of the science fiction books I read with female protagonists are those categorized as science fiction romance. If they are "straight SF," well... I don't really recall too many books that have female leads unless they are written by female authors. The Jacobs Ladder SF opera by Bear comes to mind as an example right off the bat. Oh and by a male author, Embassytown by China Mieville also had a female lead. I need to check out the Valor series by Tanya Huff! But going back to Cordelia, she's a fascinating character and like you, I wish Bujold had written a few more books from her perspective. The only I can think of off the top of my head that are probably more straight SF besides Huff's Valor series is Mike Sheperd's Kris Longknife series (which I have yet to try but want to) and David Webber's Honor Harrington series (ditto). I saw a really great review recently for the second novel in Jean Johnson's series. The first got mixed reviews and I'm tempted to jump right in with the second one, the latest, which is something I don't normally do. Hmm... David Webber? I have a book in my TBR by him. Let me check to see if it's part (or the first book) of the Honor Harrigton series. I will check on the others ones. Thanks for the heads up! The first Honor Harrington book is On Basilisk Station. It rocks, highly recommended. Same with Honor of the Queen, the second book. Those are two of my favorites, with the prison planet jailbreak (whose name and number order I forget right now) as a close third. Thank you SO much for all the great information about the Honor Harrington books. I actually went online and looked up the series, and am definitely going to go for it! The book that I have by Weber is a standalone that has some pretty bad reviews. :( A 2010 release... Anyway, I am keeping all of your notes in mind, but I LOVE that Weber loosely based the books on Horation Hornblower/Admiral Nelson.